Battle Checkers Battle Checkers™ is a two-player action/strategy game based on the well-known game of Checkers, but with the addition of a deck of "action cards" which are drawn and/or played on each turn. 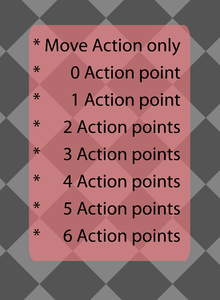 These action cards change and enhance the standard checkers gameplay, adding a bit of RPG-style action. Action cards include things like forcing promotion or demotion of the checker pieces, granting special powers to pieces, creating obstacles on the board, etc., or affecting the cards themselves, such as modifying the player's hand or deck, discarding/drawing cards etc. 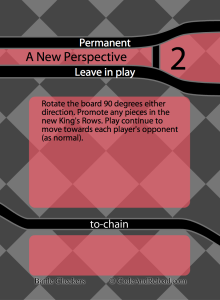 This game does NOT includes the checkerboard, checkers, and rules for checkers. A version with these components can be found at: https://www.thegamecrafter.com/games/battle-checkers-with-checkers-set . Also, check out Battle Checkers Custom Deck Generator to create you own Custom Battle Checkers game.